This post ran originally on the Smithsonian Collections blog. These books, in languages such as Mohawk, Ojibwa, Dakota, and Choctaw (to name a few examples; many of the texts include parallel translations in English) support the research of anthropologists in the National Museum of Natural History. These printed texts also complement the manuscripts and archival materials in the collections of the Smithsonian's National Anthropological Archives. The oldest volumes, which are housed in the Libraries' Joseph F. Cullman 3rd Library of Natural History and John Wesley Powell Library of Anthropology, are still actively used today by historians, biographers, and linguists interested in learning how different languages evolved, how translations were made, and how concepts were communicated across cultures. Many of the earliest printed texts of American Indian languages were created by Christian missionaries, who were supported by their denominations and by institutions such as the American Bible Society (founded in 1816), the American Board of Commissioners for Foreign Missions (founded in 1810), and the British and Foreign Bible Society (founded in 1804). Not surprisingly, besides dictionaries and grammars, some of the most typical early publications in American Indian languages were books of the Bible, catechisms, and hymnals. Shown above are the parallel title pages from The Gospel According to St. Luke, translated into the Mohawk Tongue / Ne Tsinihhoweyea-Nenda-Onh Orighwa Do Geaty, Roghyadon Royadado Geaghty, Saint Luke, translated by Henry Aaron Hill (also known as Kenwendeshon), printed in New York City for the American Bible Society in 1827. Kenwendeshon was a member of the Mohawk tribe who served as an interpreter and catechist for missionaries of the Church of England and the Methodists. Several of his translations of the Gospels and hymns are owned by the Libraries. 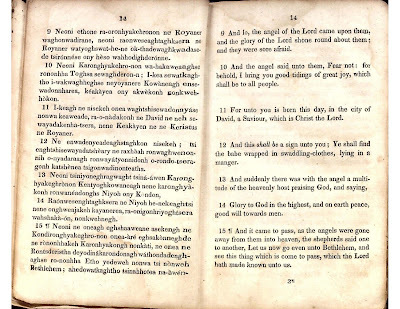 Other translations of the Bible in various American Indian languages owned by the Libraries can be found in the Smithsonian Collections Search database. In recognition of this Christmas season, shown below are parallel translations of Mohawk and English from the Gospel according to Saint Luke, chapter 2, verses 9-15 (the English language translation is from the King James version of the Bible). The passage describes how the Angel of the Lord appeared to shepherds in the field, to announce that the Christ Child was born in Bethlehem. 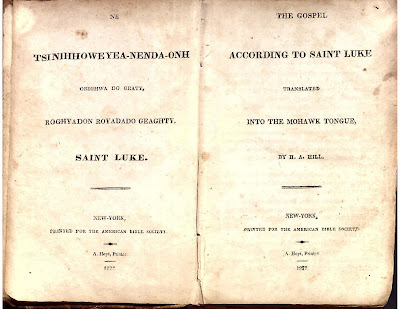 The Gospel according to Saint Luke, translated into the Mohawk tongue / Ne Tsinihhoweyea-Nenda-Onh Orighwa Do Geaty, Roghyadon Royadado Geaghty, Saint Luke. Translated by H.A. Hill (Kenwendeshon). New-York: Printed for the American Bible Society, A. Hoyt, printer, 1827. Call number PM1884 .B53 1827 SCNHRB (Cullman Library). It is great to see the Smithsonian is interested in showing the Christian influence in the early days of our country. Would there be an interest by them to buy a Christian Sunday School Picture/Card dated Sept. 17, 1905 (106 years old)? It is in good shape and is from David C. Cook Publishing Co. Elgin and Chicago, Illinois. So it is American Made. I don’t know where else to ask this question. I’d like more people to see this than just my family.